Photography can sometimes be cruel because it shows every imperfection and sometimes highlights the areas that we, in our minds, have tried to block out. Weight, acne, yellowing of teeth, double chins, dandruff, etc. Little things that we, or others who see us, overlook every day. 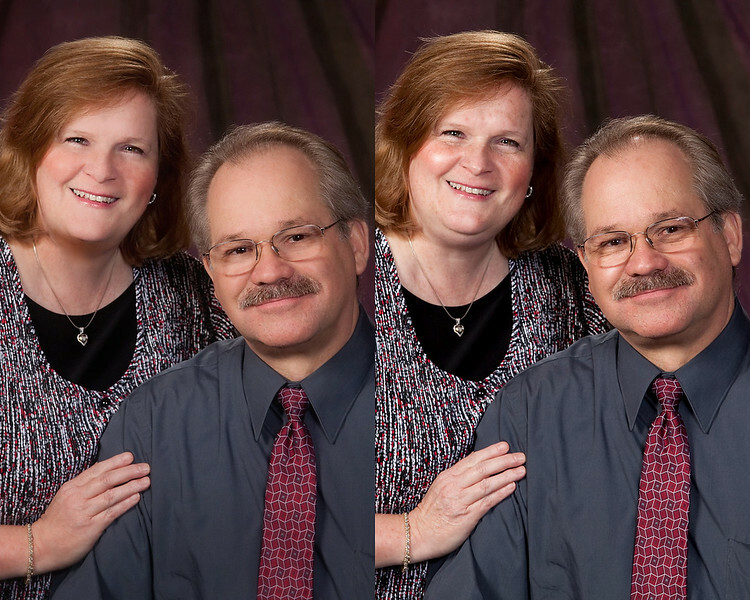 This is one reason we specialize in retouching and enhancing our images. We help people look their best in a natural and pleasing way. A trend in photography is to do a portrait sitting and give the client all the jpg images at the end of the sitting. 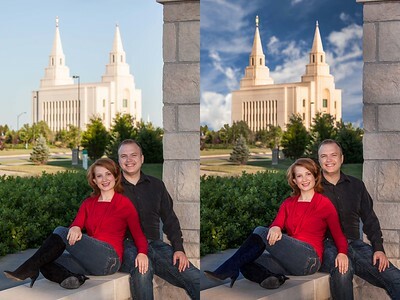 The disadvantage to doing this is you won’t get the full effect of what the image could be. Below are some examples of images straight out of the camera, and enhanced images. Notice the difference it makes in the final product. Which one would you want hanging in your living room? 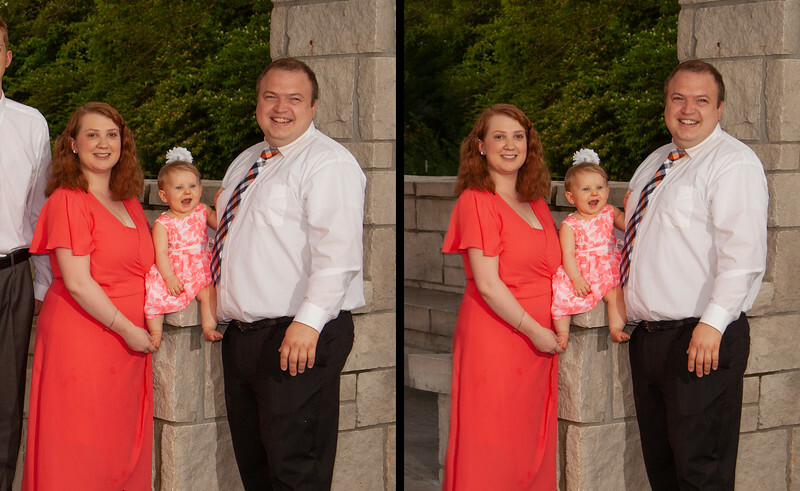 For every hour we spend taking your photographs we will spend two hours enhancing, tweaking and color correcting your images so they will produce the best print or visual presentation possible. Check out the photograph on the left and see what changes have been made. 1 - The finished picture was originally part of larger family group. 2 - Both mom and dad have lost some weight both in the body and face. Camera lenses tend to make us all look a bit heavier than we are. 3 - Dad is a squinter and his eyes have been opened just enough to still look natural. 4 - Dads shirt has been tucked in. 5 - Mom and dads teeth have been whitened. Facial retouching is so important in making us look the best we can. 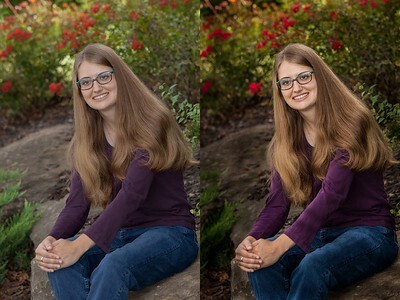 Notice the skin tones in the image on the left are much softer. The double chins and bags under the eyes are gone. In Real Estate Photography it is important that the lead off image is eye catching and beautiful. Don’t worry if the day isn’t quite perfect because your finished photographs will be. We are experts at adding a beautiful sky or a dramatic sunset. Each and every interior photograph will also be enhanced to bring out all the beauty that the buyer wants to see.